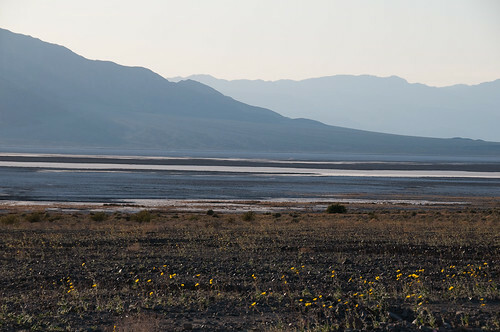 Death Valley, originally uploaded by Ian Hutton. I've made it as far as Death Valley and have uploaded the first few photos to flickr (see my photo stream). After landing at Las Vegas I picked up my wheels (some kind of Toyota pick-up) and hit the road. I arrived in Death Valley late afternoon to be greeted by a sand storm. I managed a few "sunset" photos but the general haze and experience of being sand-blasted soon put me off and sent me searching for my motel. Whilst checking in I noticed that the power was a bit dodgy - the lights went off three times due to the high winds - and just as I made it to the restaurant for dinner the power went out and didn't come back. I gave up, ate an M&S cream egg (thanks K!) and went to bed. Today was much better, with low winds and clear skies providing the perfect opportunity to explore and take lots more photos. I've been from salt lakes to sand dunes and everywhere else inbetween. Tomorrow I aim to catch the sunrise and swing by a ghost town before heading back to Las Vegas to get down to some work.